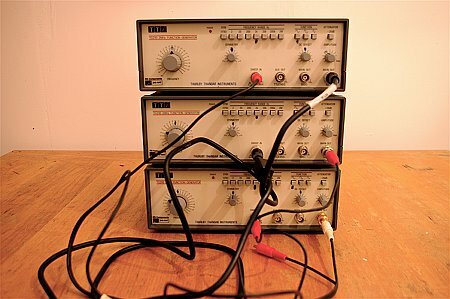 Oscillator was made using 3 old audio oscillators which were originally used as test equipment. The oscillators a all have modulation inputs. By feeding the output of one oscillator into the input of the next I was able to make a crude 3 oscillator FM synthesiser. This produced some interesting noises. Paul and I recorded some knob twiddling and then cut up and edited the resulting samples in Ableton Live. The video was created by writing a simple Processing sketch which takes the output from Live ( routed via Soundflower) and displays it as a waveform. The sketch samples every half a second which corresponds to one beat at 120 BPM ( actually the sampling rate is slightly less than half a second to make the frames of the video slightly out of synch to create a blurring effect). Each frame is blurred after it is rendered to create so that the waveforms gradually fade into the background. Finally the video was imported into imovie and synced up to the original audio.